Grounding monitor. Overfill controller. Valves. Meters. Loading racks can get cluttered and unsafe! The LOGIC grounding monitor and controller solves these problems. The LOGIC monitors single-compartment, top-loading operations. 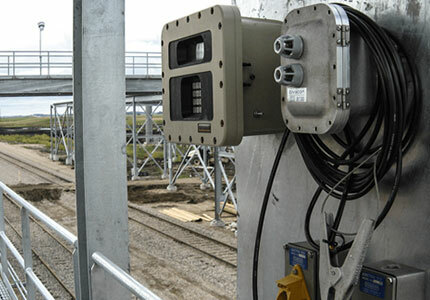 The grounding monitor provides multiple truck and railcar grounding options, with enhanced features that include overfill monitoring and spill prevention, loading arm position monitoring, enabled dead-man control, and logging of external and internal temperature and humidity. LOGIC also offers the worlds first “active” grounding circuitry. This smart system tracks the rates of static buildup and discharge to ensure the grounding system isn’t overwhelmed due to environmental issues. A simple visual interface allows the operator or terminal manager to immediately see operational issues and activities via a pre-set menu. Real-time wireless communication to the terminal automation system expands the grounding monitor coverage beyond the loading rack and into the control room. Finally, the LOGIC controller continuously runs self-diagnostic checks maximizing safety and minimizing downtime. All of these features add up to the world’s first and only all-in-one ground controller that not only enforces proper grounding and connection procedures at the loading rack, but also provides a log of those events for maximum visibility to management. The LOGIC ground monitor enclosure’s unique state-of-the-art technology and overlaying intelligent firmware is a fail-safe ground verification watchdog for total system operation. A permissive is only allowed when the firmware is in agreement with the hardware. LOGIC ground verification monitor will capture and retain a minimum of 5000 loading/unloading events. The unit’s memory has a revolving buffer, with the information being stored in its integrated memory. Wireless technology enables simple downloading of transactional data. The LOGIC grounding monitor & controller provides multiple options for overfill – optic, NAMUR, float or capacitive technologies. The unit can be configured to work with resistive ground monitoring options such as a ground clamps, single or dual grounding lugs, and other intelligent industry standard solutions. The unit interfaces with a variety of read switches and NAMUR sensors for loading arm position monitoring. Dead-man operation interface can be hard-wired or wireless. LOGIC ground monitoring system will capture and retain a minimum of 5000 loading and unloading events. The ground verification system memory has a revolving buffer, with the information stored within its integrated memory. Used in conjunction with the LOGIC Back Office Management & Reporting System, the ground controller will wirelessly transmit each transaction to the control room in real-time. This provides the terminal with unparalleled levels of intelligent data regarding its loading operations. 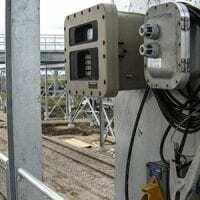 Traditional grounding monitor and ground controller systems can require up to three or more "dumb" boxes to provide the functionality that LOGIC brings in a single intelligent enclosure. Additionally, the LOGIC grounding verification monitor and controller will tell you to plan preventative maintenance such as replacement of the moisture pack or when cables need replacing. Using less wiring, a single LOGIC enclosure utilizes less loading platform space and is inherently more reliable. LOGIC grounding monitor will operate with a variety of industry standard grounding options such as clamp, ground lugs, and intelligent grounding options. LOGIC grounding controller provides access to a broader customer base and is not limited by one or two truck configurations. By covering all of your ground monitoring needs and allowing you to remotely and instantly monitor loading, it’s the one ground controller that truly enhances both efficiency and safety. LOGIC grounding monitor will work with industry standard overfill sensors including Optic, NAMUR and float technologies. The overfill device is normally provided by the load arm manufacturer. LOGIC grounding monitor will operate with the vast majority of recognized industry standard overfill devices used for single-spot, top-loading applications. This allows a wide variety of alternative overfill technologies while using just one ground verification controller. LOGIC ground controller will capture and retain a minimum of 5000 loading/unloading events. The unit’s memory has a revolving buffer, with the information being stored within its integrated memory. Wireless technology enables simple downloading of transactional data. When used in conjunction with the LOGIC Back Office Management & Reporting System the grounding verification system will wirelessly transmit each transaction to the control room in real-time. Additionally, the LOGIC ground controller will inform you to plan preventative maintenance such as replacement of the moisture pack or when cables need replacing. The unit can interface with a variety of reed switches and NAMUR sensors for load arm position monitoring. These sensors are normally provided by the load arm manufacturer and are hard-wired into the grounding monitor via a junction box. The Load Arm Position Monitoring feature ensures that a permissive is only given when the load arm is in its correct operational condition. 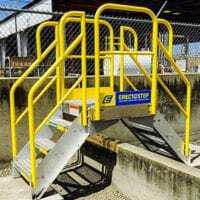 This feature also provides flexibility to the terminal operator, ensuring that the load arm position can be monitored in any type of loading operation.